Remember that song from the 60s? Hugh Masekela, a trumpet player from South Africa, recorded it in 1968; the Friends of Distinction carried the vocal version of it into the Top Ten in 1969. I thought the lyrics were silly then (still do), but the instrumental is great. Well, here’s another slant on Grazin’ in the Grass, this one from an article in the 1884 Annual Report of the Maine Board of Agriculture – an extensive inventory (with detailed accompanying plates, two of which I’ve included here) of The Grasses of Maine. “The grass family is, without doubt, of far greater importance to mankind than all the other families of plants combined,” wrote Professor C.H. Fernald, Maine State College, Orono. According to the (Agricultural) Census report for 1880, there were 1,107,788 tons of hay cut in the State of Maine in 1879; there were ninety identified species of grasses in Maine at the time. White grass, prickle grass; meadow, common and floating foxtail; timothy, herdgrass, thin-grass, fly-away grass, tickle grass, mountain red top, wood reed, Canadian small-reed, Richardson’s feather grass. There’s salt grass, marsh grass, fresh-water cordgrass; Bermuda grass, scutch grass, orchard, meadow, quaking grasses. Each is described thoroughly: There are details of stems, leaves, panicles, spikelets; descriptions of habitats (“grows in wet meadows, bogs near the coast, wet woods and the margins of ponds”); month of seeding, stock preference (“floating manna grass is relished by cattle...”). There’s one grass with a series of common names that leaves me as tongue-tied as its Latin Agropyrum repens – remember, these are 1880s common names for one particular grass in Maine. Here goes... witch, twitch, and quitch grass, quick, and quack grass, quake grass and squitch grass. Say those ten times fast, then fire up the John Deere and get mowing! 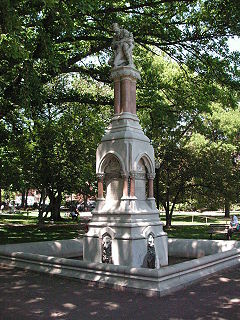 This, known affectionately as the “Ether Monument,” consists of a statue and a fountain; it’s planted in the Public Garden near the corner of Arlington and Beacon streets in Boston, Massachusetts. It commemorates the first successful public demonstration of the use of ether as an anesthetic on October 16, 1846 at Massachusetts General Hospital. It was exactly one hundred years before I was born. I remember going to see this monument when I was about six or seven and still lived in the Boston area. My grandfather – William W. Howell, a pediatrician and Harvard Medical School graduate (Class of 1900) – thought that, since I was (firstly) a doctor’s grandchild and (secondly) born on the 100th anniversary of this event, it was only proper that I be familiar with the monument. He told me that, before ether, many people actually died during surgery – not from the surgery itself, but from the pain of surgery! Ether changed the course of modern medicine, he told me; it saved lives, it allowed for new medical procedures. I really didn’t care about the ether business; I was mostly fascinated by the beasts carved on the lower panels of the monument! William Thomas Morton (1819-1868), an American dentist, first learned of the effectiveness of ether in 1844 from his Harvard Medical School chemistry lecturer; he dabbled in experiments (probably using his dental patients and/or himself as guinea pigs), but it wasn’t until 1846 that a truly public demonstration occurred at Massachusetts General Hospital – Dr. John C. Warren painlessly removed a tumor from the neck of a patient who had been anesthetized by the administration of inhaled ether. Later, William Morton joined the Union Army during the Civil War; he used ether to help more than two thousand wounded soldiers in several battles, including the dreadful Wilderness Campaign. Interestingly, one of the other soldiers who served in the Wilderness was William W. Howell’s father – my great-grandfather, Selah Howell – who drove an ambulance for the Sanitation Commission. The monument was designed by William Robert Ware, a Boston architect. The sculptor was John Quincy Adams Ward (now there’s a solid Boston name!). It’s about forty feet tall. "To commemorate that the inhaling of ether causes insensibility to pain," it reads. "First proved to the world at the Mass. General Hospital in Boston, October A.D. MDCCCXLVI." Just think: A monument dedicated to a medical breakthrough that occurred exactly one hundred years before I was born. I’m honored to share the date.